The only thing Arthur loves as much as his brother are his dragons. That have yet to be seen. Mwa ha ha ha. In due time. In due time. The next time we see Wiglaf and Mordred, I’m planning on starting a whole new arc that will involve a significant jump in time. So, would you rather like to hang out with Arthur and Sedrick (or possibly Janus, Safir and Goeffry) for a while longer – or just jump right into the new arc with Wiglaf and Mordred? I could go either way at the moment so I figured I’d ask what you guys would like to see. ^_^ Thanks so much! *Can’t beathe. * *Laughing too hard. * Arthur, Arthur, you should have gotten your dragon sexed before putting it out to breed! Sedrick had to deal with an employee benefits meeting? Poor man. Poor, poor man. I like the detail of the architect’s desk in the background. Nice work on that, Liliy! Eh, hang around with Arthur, Sedrick, Janus, and Goeffry for a while, if you’ve got the ideas to spare. Wiglaf and Mordred need some time to work out some scratches and dents now that things have somewhat normalized. *Re-reads comic. * Wow. That project really WOULD require the use of a t-square. Safir’s storybook? *Curious. * *Very curious. * I have GOT to talk with you on a more regular basis. 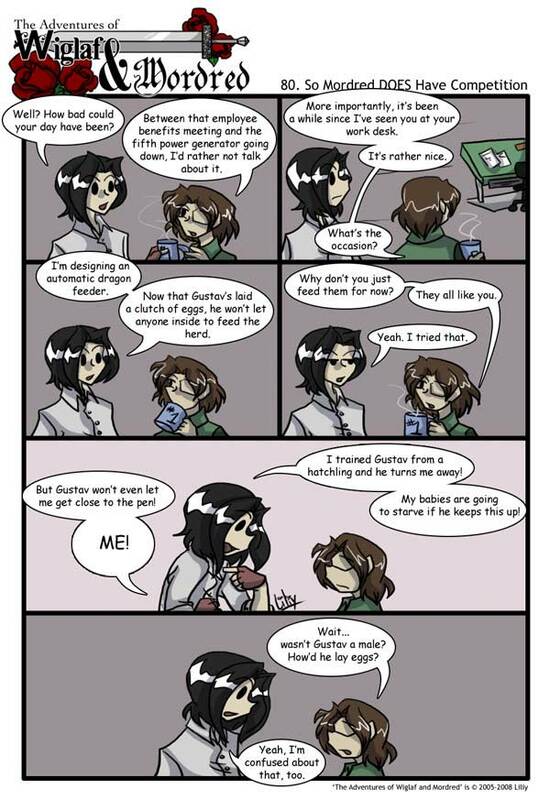 I wonder what Arthur’s engineering designs look like for the automatic dragon feeder. And what will he design next? Maybe he could design a catapult, or one of those siege towers on wheels for attacking castles! Mwa ha ha ha. I vote for more Arthur and Sedrick comics for a while. As characters, their chemistry is good and creates amusing scenes. Nice job! I wanna see big arc with Wigalf and Morded! I love those 2.^^ These guys are great, but a big arc with the main 2 I would prefer.